So, you love spending your free time in the great outdoors, but are bored of having only preserved food because cooking systems are too heavy to haul around? Wouldn’t it be great if you could have a nice, hot meal after a whole day of walking? Well, this is actually quite possible and easy if you have the best backpacking stove in your backpack. Backpacking stoves come in a wide range of shapes, sizes, and capabilities, and since open fires are almost always against the law due to several safety concerns, your only choice when it comes to cooking in the wilderness is to use a stove. But, there is a huge variety of backpacking stoves available in the market today and when you don’t know what to look for and where, finding the perfect model for your needs gets complicated. This is why we decided to help you out and do all the research for you. In this article, the first thing you will learn are the most important features that should be kept in mind so that you are sure the model you are buying, is exactly the one you need. After that, you will go through the reviews of the best model on the market, as well as some other relevant products that we recommend. At the end, the only thing you have to do is to make a choice, but rest assured, it will definitely be the right one. 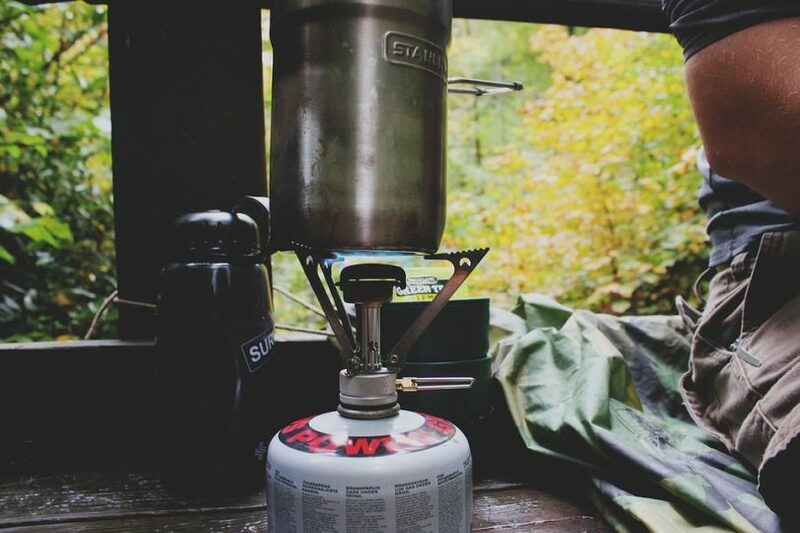 Now before we look at the different brands and their specific uses, it might be a good idea to quickly understand the main features to look for in a backpacking stove. You will have your own reasons to buy a stove too. It would be useful to analyze these details so that you have a clear picture of what you actually want. So let’s go through those features first. Some stoves will be suited to specific kinds of activities. For example, some may be useful in cold weather while some may not. Considering where and how you will use your portable stove is a key factor in determining the right one for you. These specifications are usually mentioned in the product descriptions. It is best to consider the nature of your activity in terms of where and when, in order to find a product that will suit your needs. You will most probably find a lot of good matches. What exactly will be using your stove for? This is a very important question to answer before making a choice. Some may want to simmer to slow cook meals, while some may just want rapid boiling for water and food. Once you are sure how you’ll be using your stove you will be able to narrow down your choices. There are various types of stoves to choose from. 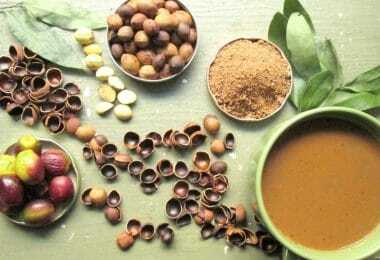 Some will be able to boil water quickly for preparing hot drinks to keep you warm. While others will allow you to prepare a big meal for a group of people. Something else you might want to consider is the number of people in your group. If you are going on a trip by yourself, you could choose one that’s smaller and lighter. For group trips, you may need stoves that are capable of holding bigger pots and pans. You also use more than one stove. You should also understand that the bigger the stove the heavier it will be. If you are hiking alone or with a single partner, carrying a big stove might not be the most convenient option. The kind of fuel you would be using more often depends on your personal choice as well as the location you are at. Some are good to use in cold temperatures and some are not. Some types of fuel cause a lot of pollution too, so if you’re someone who prefers green options you’ll need to opt for a stove that supports them. You should also consider how easy it is to access the fuel when you are in the wilderness. Most of the time, you will find options that support different types of fuel. These are highly versatile and more convenient to use. By capacity, we mean the amount of fuel it can hold and the burning time. For longer trips, you may need to carry extra fuel or buy a bigger stove. You must also note that backpacking stoves generally have a low fuel capacity as they are meant to be light and portable. Going for a bigger stove in that case will have its pros and cons. While it is going to be more convenient with a lot of cooking options, you will have to carry more fuel to be able to use it. This is extra weight that you will have to handle in the wilderness. This is also very important because it is not a good idea to buy something expensive and then just use it once or twice. If you’re a frequent camper then you could opt for expensive ones, but if you’re not, you may want to look for cheaper ones. Again, it is not always necessary to buy expensive stoves. With some research, you may be able to find a durable one at a cheaper rate. All you have to do is to do some proper market research and you will be able to find one that best matches your needs. When you make online purchases, since you cannot try the product beforehand, you must make sure you are able to contact the manufacturer in case of any issues. Most sellers offer you warranties too, but it’s important to know the terms of these warranties and what they include. You could also check reviews about the customer support offered by companies and also the quality of their service. A high-quality product that comes with good after sale service is definitely a plus. You will not have to worry about replacing spare parts and you will be able to have it fixed if it breaks down. Even if it costs a little bit more, it will definitely be good value for the money. 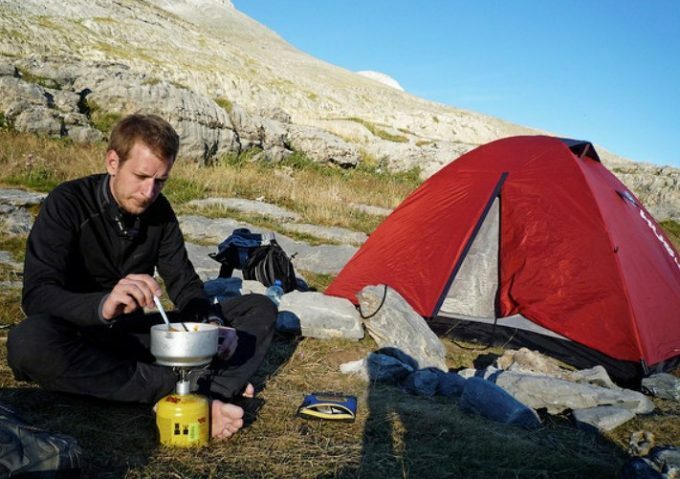 Now that we have covered the general points you could have in mind, let’s take a look at some popular backpacking stoves you could try out. Remember these are suggestions and you will have to understand your needs before you pick one. 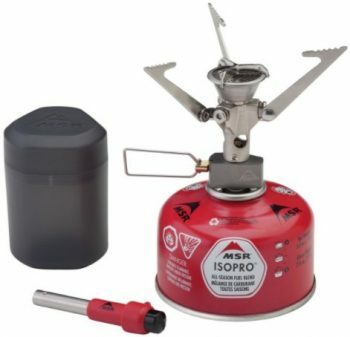 Description: The MSR Windburner Stove System is ideally suited for camping trips and is said to cook quite fast just as mentioned by the manufacturers. It also comes with easy to follow instructions so even if you’re a first timer, you won’t have any problems. It does not use up much gas and burns well, even when it’s windy. 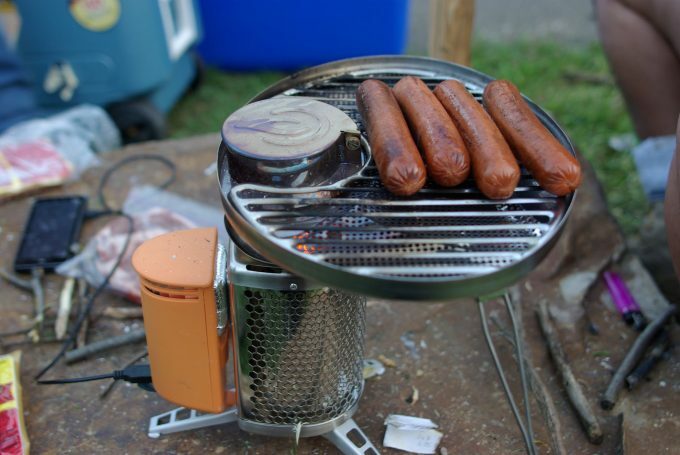 The Windburner is an all-in-one stove, which comes with cookware, and an eat and drink mug. Also, it is designed to cook fast in any weather condition and works quite well in extremely low temperatures. Furthermore, it is an easy-to-carry stove since it is very lightweight, and it features a radiant heat burner, which means better fuel efficiency, and less cooking time. Another point to be noted is that the reactor is better suited to cold weather and when it’s snowy so many buyers have recommended that you buy a different one for when it’s not so cold. It’s also said that the flame may get blown out by the wind when on simmer mode. On the whole, this product is a good choice if you want something lightweight to take on camping trips and to have quick meals between your adventures. Related: Enjoy your meals with the MSR 4 Piece Folding Utensil Kit. The kit comes with a pinch to fold locking mechanism and is made of BPA free materials. Description: The MSR Reactor Stove System is a comprehensive cooking system that comes with the cookware you need for preparing the best dishes. 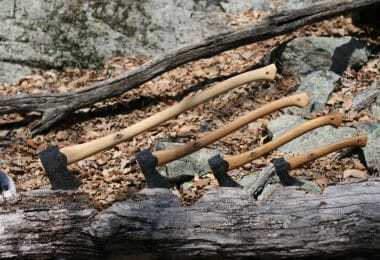 It is the fastest to use in the wilderness as it boils 0.5 liter of water in about 1.5 minutes. The best thing about this stove system is that it can be used in very windy and cold weather conditions. Just as the manufacturers claim, it is indeed a fast and fuel efficient system because this is the main feature that is highlighted by most customers who have purchased this product. The burner is enclosed within a heat exchanger which protects the flame from the wind. It is fuel efficient since the stove system is made in such a way that it uses the minimum amount of fuel allowing you to carry less and spend less. It is most recommended when you go on camping or hiking trips with friends and the stove has enough capacity to cook a quick meal for a group of three. You must note that the product does not include a fuel canister so you’ll have to buy one separately. You also need to have a lighter to start the stove because it does not have auto ignition. It would be ideal if you’re traveling with a friend and it may be a little too much for a single person. You could look for cheaper and smaller options if you’re travelling alone. 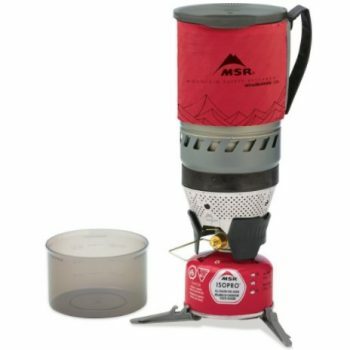 Related: A great pot, such as the MSR Reactor 2.5 Pot, will allow you to prepare delicious warm meals wherever you are. It is a must have. 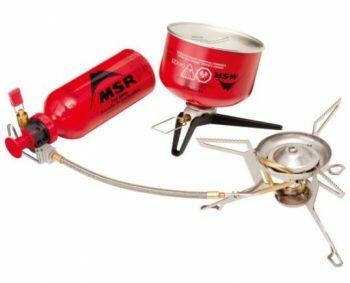 Description: The main highlight of the MSR WhisperLite Universal Stove is its hybrid fuel capacity, which lets you use gas or liquid fuel. It is very suitable for backpacking trips again and also has a tool for any emergency servicing that may be required while outdoors. The stove operates on kerosene, gasoline, white gas and butane. It is made of aluminum with stable steel legs that will keep it in place. It will provide steady and consistent output even in cold weather. It is very lightweight and even comes with a bag which makes it ideal for backpacking or other adventures that involve a lot of walking and climbing. However, it may not be suitable for someone who is looking for something that is extremely light and wouldn’t use it much on a trip. It may just seem like an additional weight, if this is the case. On the other hand, if you frequently go on camping trips and would love to cook a good meal for yourself, it would be perfect especially in cold weather. Thanks to the self-cleaning feature, it is very easy to maintain in the field. 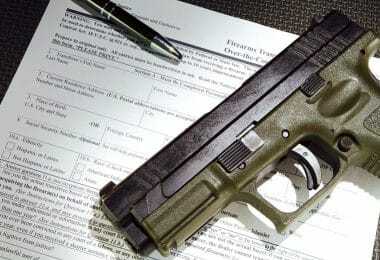 It comes with a limited lifetime warranty as well. Related: The MSR Super Fuel will burn clean. It reduces clogging and will improve the performance of your stove. 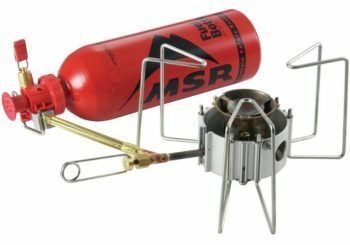 Description: The MSR Dragonfly Stove features a dual valve design that allows you to control the flame. This stove is perfect for boiling, simmering and everything in between. It boils water very quickly, which is perfect for your time in the wilderness. Also, this stove folds up smaller to 1/3 of its working size, although it may not be among the smallest and lightest weight stoves available. It is best suited for camping and backpacking trips though, because it is after all fairly lightweight. The stove is versatile, as it burns with kerosene, white gas, jet fuel, diesel and auto fuel. It comes with a shaker jet, which helps clean dirt and debris making it very convenient to use and clean in the wilderness. The stove also comes with a lifetime warranty. The product can hold large pots and fry pans as well. This means that you can prepare food comfortably and easily. It is stable and safe to use. The product is a bit noisy when it burns so some may feel uncomfortable using it on camping trips. Nevertheless, it is very convenient to use if you are spending a few days away from home and still want to have a hot comforting meal. Related: The MSR Folding Spork Set is very easy to use. It is made of BPA free materials and will collapse perfectly. Each spork comes in an elegant color that will match with your other cooking utensils. 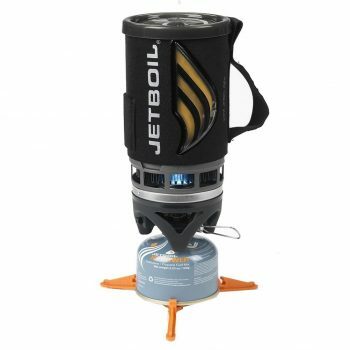 Description: The Jetboil MiniMo Personal Cooking System is said to be very lightweight yet durable with great fuel efficiency too, which makes it perfect for backpacking trips, or other trips where you need as less weight in your backpack as possible. As far as the ease of use goes, the stove works on a push button igniter so you wouldn’t need to carry a lighter or the matches. Also, it is designed to let you cook and eat right out of the cup, thanks to the lower spoon angel. Furthermore, the stove comes with quite useful features, such as the drink through lid and a measuring cup. The metal handle is the best for cooking and eating. 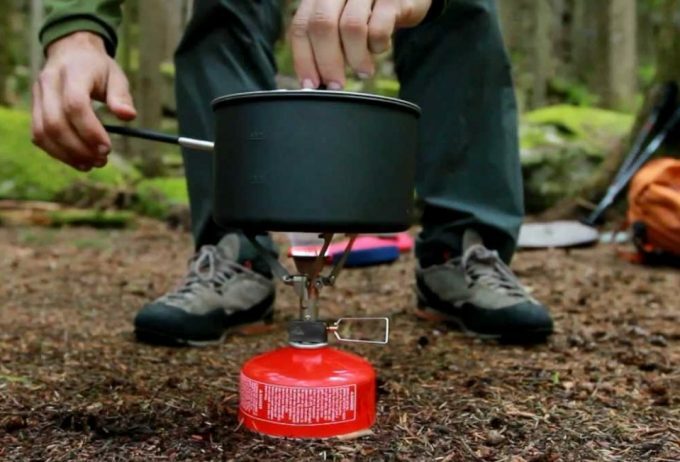 This amazing backpacking stove comes in 8 different colors. You will be able to choose the one that best matches your taste. This is another stove which burns well in low simmer although it is better for boiling and simpler tasks. Again, this product doesn’t blow out when it’s windy. Related: The MalloMe Camping Cookware Mess Kit is what you need to prepare delicious meals when you are out in the wilderness. The kit is non-toxic and is made of the best materials to conduct heat perfectly. 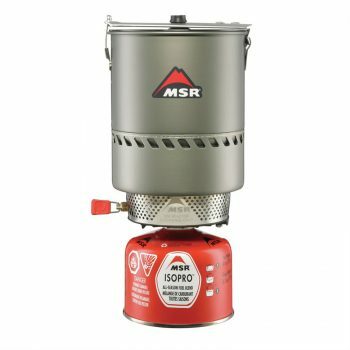 Description: The MSR MicroRocket Stove is said to be great value for money as it does what its manufacturers have claimed it will. The best thing is that it’s lightweight and still durable. It also comes with a carry bag and a small igniter. This backpacking stove weighs only 2.6 oz, which makes it extremely easy to carry around. Also, it folds extremely small, which adds to the convenience of carrying around, and is considered to be one of the best backpacking stoves for longer hiking trips. Furthermore, this stove is windproof. Meaning that it comes with a wind clip that provides protection under windy conditions. You can use it to boil 1 liter of water in just 3.5 minutes, which is way faster than other stoves of the same size. In spite of its small size, it has a big flame that you can easily control. On the whole, the stove would be an excellent choice if you’re going on solo backpacking trips and prefer something super small and light. Related: Enjoy your meals on the comfortable Legit Camping Double Hammock. It is lightweight, durable and comes in many elegant colors. It is also very easy to set up. 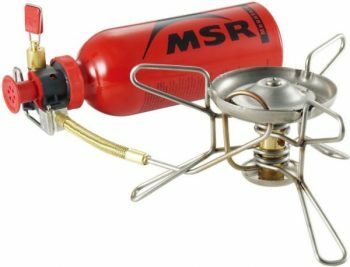 Description: The MSR PocketRocket Stove is mainly suited for camping trips and adventures that require a lot of walking and climbing. The main feature is that it is ultra-light and small as its name suggests. It weighs only 2.6 ounces, and would still be enough for all your camping needs. Furthermore, this stove is also amongst the most powerful stoves of its type. It boils 1 liter of water in just 3.5 minutes. Another plus is that it is quite cheap too. The stove cooks really quickly with great fuel efficiency, saving you both time and cost. It is recommended to use with MSR IsoPro fuel canister, which is, unfortunately, not included. Although it is suitable for a solo backpacker, it can easily support bigger pots. This is what you need to pack if you want to keep your backpack extra light. Related: You don’t have to pack a ton of products for a fun time in the wilderness. The Gold Armour 17Pcs Camping Cookware Mess Kit contains everything you will ever need to prepare your meals. 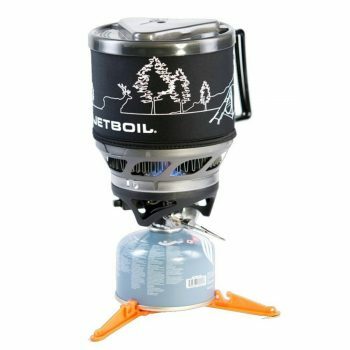 Description: The Jetboil Flash Cooking System is very suitable for people who want to boil some water and heat up some food. You can quickly clean up the stove after use and fit it into the cooking cup for packing. 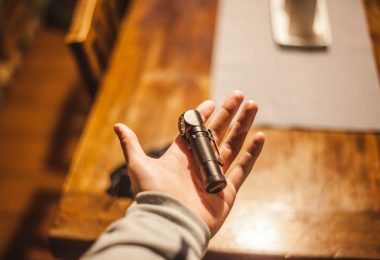 Since it has an auto starter, you won’t need to carry matches or a lighter, and the product comes with a color changing temperature indicator. It also comes in 8 different colors, so you have the option to choose. The Flash cooking system is an efficient model that won’t lose much heat, meaning that it is quite fuel efficient. It can boil half a liter of water in 2 minutes. It features a windscreen so that you can use it in extreme weather conditions. This backpacking stove features a neoprene lining that will keep your food and drinks hot for a longer period. It is very easy to use thanks to the sip through lid. Related: Preparing warm, delicious meals is now a breeze. The Jetboil Stainless Steel Pot Support will support a lot of traditional pots and pans for the best cooking experience. 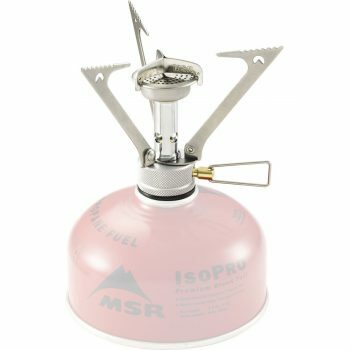 Description: The MSR WhisperLite Stove is considered as the standard product for general purpose use, and it has gained some popularity in that respect. It burns clean with white gas and white gas varieties, which makes it quite versatile. Furthermore, it is also considered as a comparatively lightweight and one of the easiest to pack products. Also, it is manually pressurized, which means that it can work in different weather conditions and elevations. This stove is durable as it is made to last as it made of stainless steel and brass. It comes with the shaker jet technology too, which makes cleaning quite effortless. Moreover, the manufacturers offer a lifetime warranty with the product, and considering how affordable it is, we think that this stove is a great deal with great value for your money. Related: The Helinox Chair Zero Camping Chair is the best to pack on your hiking, camping or hunting trip. It is very easy and quick to set up. It is also durable and lightweight. We have reached the end of our article. 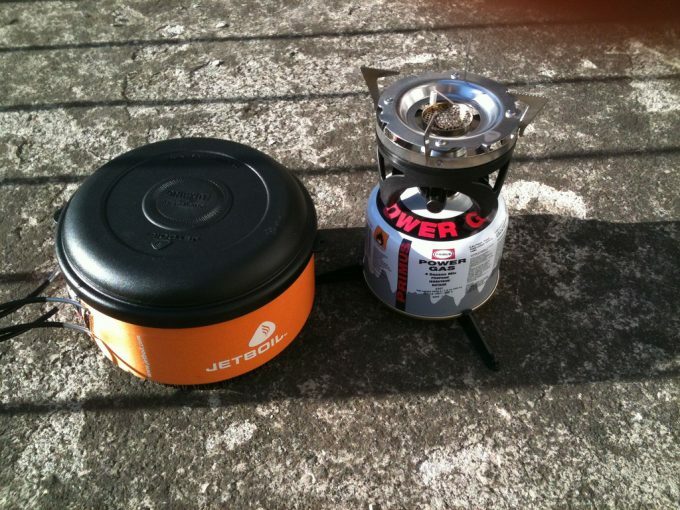 So, now you’ve seen our recommendations for when you are trying to choose your backpacking stove. We are certain that you found our features to consider useful, and that you are now sure that the purchase you make, will be a perfect one for your needs. Since there are a lot of options, we recommend defining your personal preferences first and deciding which of the features are the most important to you. For example, if you are a solo adventurer, you will want a stove that is small, easy to pack, yet still provides enough heat to boil water or cook a meal fast. In this case, we would recommend the MSR Microrocket model. On the other hand, if you are always camping or backpacking with friends, then you will need a lightweight model that is capable of boiling a larger amount of water fast. For such situations, the best model we would recommend would be the MSR Reactor stove system. In any case, you should always check for warranties and after sales service. This is especially important if you plan to purchase your product online. Now, it’s your turn to share with us. Have you already used any of the reviewed stoves If yes, let us know your experience. Fell free to leave a comment in the comments section below, where you can also ask questions if you have any. Thanks for reading.